The NASC is pleased to announce the availability of version 1.2 of the TG20:13 eGuide, released in July 2017. This update incorporates a number of enhancements and is supplied as a free upgrade to registered users of the TG20:13 eGuide on Windows, Mac and Android computers and devices. The upgrade is available as a download from the NASC website or, for the Windows and Mac versions, as a CD available on request from the NASC. The upgrade has been developed by the NASC, in association with software developers CADS, in response to feedback received from a consultation held with the NASC membership and purchasers of TG20:13 in 2016. The new update demonstrates the commitment of the NASC to the continual improvement of TG20:13 to meet the demands of the UK scaffolding industry, and increasingly overseas. Automatic site reference. The site reference displayed on the TG20 compliance sheet now automatically defaults to the address for the location selected on the wind map screen, providing that an internet connection is available. Checking a compliance sheet. A new option has been provided to indicate that a suitable person has checked that appropriate data input options have been selected in the TG20 eGuide when generating the compliance sheet, for integration with temporary works management processes. Reporting the permitted seasons. The TG20 compliance sheet now specifies the season(s) during which the scaffold will be standing, either ‘during any season’ or ‘during the spring and summer’ depending on the option selected for the compliance sheet. Company logo. A company logo may now be added to personalise the TG20 compliance sheet header, including any accreditation logos relevant to the company. Compliance sheet illustrations. A ‘TG20 compliant’ stamp has been super-imposed on the illustration in the top left corner of the TG20 compliance sheets. This is to clarify that the illustration, although representative, is not intended to be a construction drawing. Build UK support. The NASC is pleased to announce the continued support of TG20:13 by Build UK, whose logo is now included on the header of every TG20 compliance sheet. 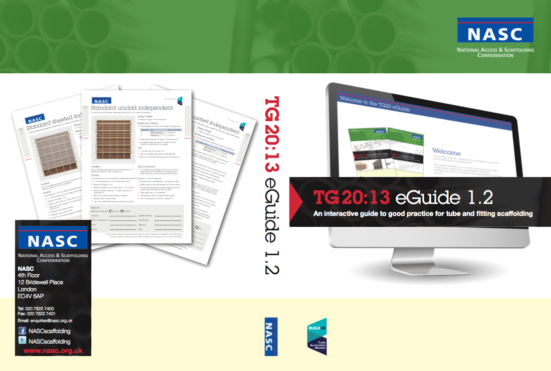 To download the upgrade as an existing TG20:13 eGuide user, or for further details regarding version 1.2 please consult the TG20 page on the NASC website.